This database of seasonal words (worldwide saijiki) will give us an opportunity to deepen the understanding of kigo issues and to appreciate the climate, life and culture of other parts of the world. In modern Japan, western clothing is becoming more and more common and the traditional Japanese robes, as described below, are not worn so much any more in the big cities. In the countryside, where I live, some are still quite common. It used to be the first day of the fourth lunar month, but now it has come to be done on the first of June. "the later changing of robes"
It was the first day of the tenth month, now often given as the first of october.
. Warm things for Winter . They are especially light and cool in summer, although nowadays, they are quite expensive.
. tsuji ga hana 辻が花 "flowers at the crossroads" dyeing method .
. joofu 上布 ramie hemp cloth .
. Yaeyama joofu 八重山上布 Yaeyama ramie hemp cloth . made from various materials. It feels quite cool in summer. sayomi 貲布（さよみ）, tafu 太布（たふ）"heavy cloth"
bashoofu 芭蕉布（ばしょうふ） "banana fiber cloth"
Basho-fu, bashofu is one of the representative textiles of Okinawa. Yukata is a Japanese summer garment. People wearing yukata are a common sight at fireworks displays, bon-odori festivals, and other summer events. The yukata is a casual form of kimono that is also frequently worn after bathing at traditional Japanese inns. Though their use is not limited to after-bath wear, yukata literally means bath(ing) clothes. © More in the WIKIPEDIA ! This was used under a kimono and could be washed easily. This was used when sleeping to prevent getting cold with sweat, especially for children.
. Echigoya 越後屋 and Mitsui　三井 . 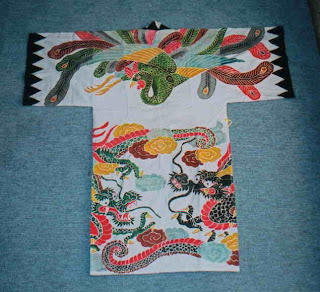 HAORI 羽織 is the general term for a coat worn over a Japanese kimono. In combinations it is often spelled ... baori. Often used by travellers of old to protect them from the sunshine. HAKAMA 袴 is the general term for a formal trouser-skirt worn over a Japanese kimono. In combinations it is often spelled ... bakama. They are very comfortable and many men wear them after the nightly bath to sit outside and enjoy the evening cool. They are usually made of cotton or hemp. Written in 寛文12年, Basho age 29, in Iga Ueno. aloha shirt, aroha shatsu アロハシャツ (あろはしゃつ) PHOTOS ! KASURI 絣, ikat, splashed patterns (...gasuri) come in typical dyeing and weaving patterns of some areas of Japanese. 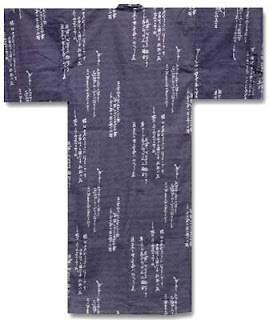 Woven bamboo under-garments are often worn by priests to protect the precious silk garments worn on official occasions. Usually they go just over the knee, are made of thin cotton or gauze and can be washed easily. Many farmers in our area wear them in the evening with no other cloths on top of them. They are extremely comfortable in the humid Japanese summer. The mummy of the famous priest Kobo Daishi at the mountain monastery Koya San is also dressed twice a year. Basho had just ended a very satisfying travel and was thus in a playful mood (karumi　軽み）.
. asagi あさぎ - 浅黄 - 浅葱 hues of light yellow, green and blue . Sugiyama Sanpu had sent Basho a new katabira robe for summer and this was his thank-you hokku. 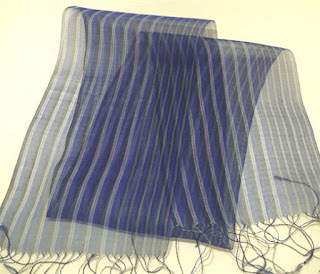 semigoromo 蝉衣 a very thin silk cloth for summer robes, as light as the wings of a cicada. This hokku has the cut marker YA in the middle of line 1. Haiga by Nakamura Sakuo !
. Kobayashi Issa 小林一茶 in Edo . This hokku is from early in the fifth lunar month (June) in 1814, about three weeks after Issa got married to his first wife Kiku in his hometown on 4/11. He seems to be remembering his time in Kyoto a few years earlier and imagining what stylish Kyoto people are doing now in early summer. Kyoto people dress more conservatively than than people in Edo and Osaka do, but they are generally more sensitive to traditional esthetics and styles. 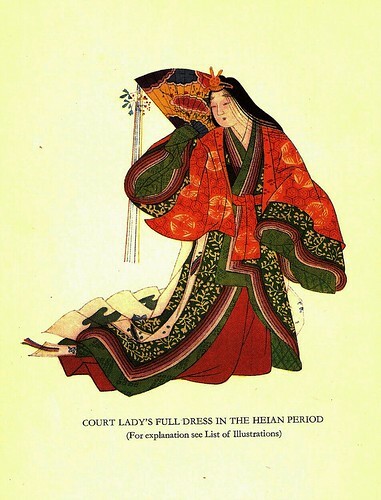 The imperial court in Kyoto now lacks real power, but it puts great emphasis on ritual, and it holds a major ceremony on the first of the fourth month, the first day of lunar summer and the day when people change from thick robes into lighter robes consisting of two thin layers of cloth. On 5/5 they will change again into still lighter single-layered summer robes, but for the moment people feel light and loose and celebrate the return of warm weather. Kyoto commoners also consider 4/1 a holiday and celebrate by going out for the day or by going around to exchange greetings and chat with their neighbors and friends. Issa seems to be writing about one such group or family who are going around seeing people and sights wearing fresh early summer robes for the first time in many months. Issa has another hokku about visiting the low mountains just to the east of Kyoto, but in the present hokku people have decided to visit the low mountains along the western border of Kyoto, a largely wooded area in which many Shinto shrines are located. (There doesn't seem to be any overt mention of Buddhism here.) New leaves cover the trees, and people no doubt enjoy watching the summer fashions others are wearing, but at some point they have decided to visit a Shinto shrine in the foothills -- perhaps the big Matsunoo Shrine there. The word kami-danomi means asking various Shinto or shamanic gods for favors or protection as opposed to making a deep, emotional confession or plea to a god, so Issa seems to be indicating that the prayers the people make on their outing are not the goal of the outing but something convenient they do along the way. He doesn't seem to be satirizing them, however, just evoking the way many people pray. Perhaps he is suggesting that, in contrast to their utilitarian and self-centered requests to the gods, the way people walk and smile full of joy and lightness in their fresh summer robes makes them minor gods for the day, a day when both divinities and humans feel refreshed and changed. The Issa scholar Maruyama Kazuhiko also feels that "western mountains" here refers to the low mountains along the western edge of Kyoto. See Issa Shichiban nikki 2.51. The geography of Kyoto was well known all over the country in much the same way that most Americans have a vague idea of where Central Park and the Statue of Liberty are, and the Kyoto court was also the center of clothes-changing festivities in Japan.
. Kyoto 京都　"Hana no Miyako" 花の都 .
. Yosa Buson 与謝蕪村 in Edo . my clothes in spring . . . The light summer garment in question is made of hemp: katabira. 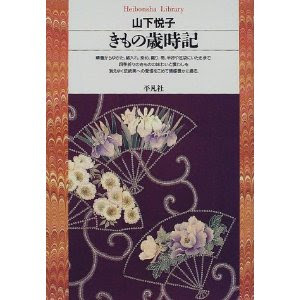 In this archive, I translate both katabira and awase as "summer kimono." geometrical squareness of the kimono. i like the traditional Japanese Cotton Bathrobes still. they are looking very gorgeous and marvelous.. Some explain this as Basho taking leave of his summer robe and friends at the same time. The season would then be early autumn. 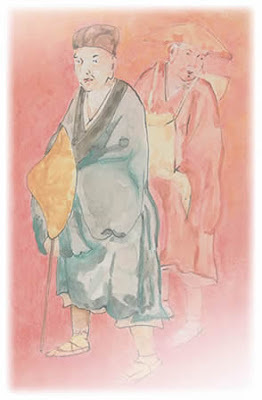 It could also be the "change of robes" for summer robes on the first day of the fourth lunar month, thus a kigo for summer, and Basho would be taking leave of his warm winter coat, getting ready for a journey in summer. MORE - read the comment ! 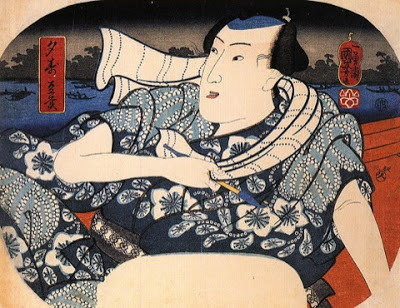 This hokku is from the 6th month (July) of 1821, when Issa was living in his hometown. Japan was a strongly communal society in Issa's time, although there was a rigid hierarchical class system, with Kyoto aristocrats and Edo-based warriors at the top of the system. Among commoners, work was a highly valued activity, and wealthy people were often referred to as muda-bito, "(socially) useless," that is, "jobless (by choice)." The wealthy still followed many old seasonal customs, such as formally changing into different robes in different seasons, but Issa feels their motivation must be different: most people in the leisured classes value such customs as brief diversions because they don't know what to do with all their free time. There were many such people in the city of Edo, but Issa seems to have been aware of some in and near his hometown, too. This hokku is from the first month (February) of 1821, when Issa was in his hometown, but the character for summer placed above the hokku in Issa's diary indicates it's a summer hokku. Issa is evidently referring to the first day or first few days of the fourth month (May), the first month of lunar summer, when most people put away their winter clothes and get out thinner early summer robes. Later, from 5/5 to the end of the eighth month (September), they change into even thinner robes to wear during the hot days of summer and early fall. In the first two lines Issa uses a colloquial idiom that praises people, usually individuals, who both do things the right way or work well and also speak well or even eloquently. Since the person in the hokku seems to dress well, I take the person to be a woman. She takes care to do things the right way and probably changes her robes punctually on 4/1. She presumably puts her winter robes back into a long wooden box, and today she wears perhaps her most stylish or elegant thin robe to celebrate the coming of summer. Since she is eloquent and articulate, perhaps she also composes or recites a waka or hokku (or two) that is appropriate to the occasion. rushes on . . .
for the festival . . .
. . . AKS ME . . . any question about Japan !